Complete your trip to Oahu with the Best of Pearl Harbor tour. Discover the #1 visited site in Hawaii, and stand where WWII began and ended. You will explore the USS Arizona Memorial, USS Missouri, Pacific National Monument, the Battleship Missouri Memorial, the USS Bowfin Memorial and Museum, and the Pacific Aviation Museum and hangars. Lunch is available for purchase at the USS Missouri. Also, you’ll drive through the National Cemetery of the Pacific, where over 13,000 WWII service members are laid to rest. Your journey ends by following in the footsteps of Hawaiian royalty as you tour Historic Honolulu. Here you can see ʻIolani Palace, the only royal palace on US soil. Be ready for unexpected views, spur-of- the-moment stops, and special sightseeing along the way! The guides may adjust route for maximum visitor enjoyment and safety. Schedule: Monday, Wednesday, and Friday. Closed on Thanksgiving, Dec. 7th, Christmas, and New Years. Pick up: Morning pickup is between 6am – 6:20am. Approximate return is 5pm. Reservations: Due to smaller group sizes these tours should be arranged well in advance of your arrival in Hawaii. What to Bring & Wear: Tour participants should dress comfortably, but remember to wear respectful attire (shoes and shirts must be worn and no swimwear allowed). They do not recommend high heels, dress, and skirts. Due to heightened security no large bags, purses, iPad cases, and clutch wallet or strollers are permitted at the Memorial. Wallets must be the size of a regular sized cellphone. Storage of these items is available for a nominal fee. Cameras and small, hand-carried wallets are permitted. Snacks are available for purchase at the Pearl Harbor Visitor Center and the USS Missouri gift shop. Note: On rare occasions due to unforeseen circumstances beyond their control, the Navy may suspend boat operations to the USS Memorial at anytime. There will be no refunds in these cases. You will still be able to enjoy the USS Arizona exhibits, visitor’s center and park monuments. March 2019 Update: The Arizona Memorial’s dock is currently undergoing repairs expected to take a few more months. Until dock repairs are complete, the boat ride will be a narrated harbor tour around the Memorial and it will not actually land at the Memorial. All other aspects of the Arizona Tour, including the Visitor’s Center, Museum, and documentary film are all operating normally. Enjoy a comfortable ride with Enoa tours! If you are cruising on the Pride of America and spending the night at a hotel in Waikiki prior to your cruise, you can do The Best of Pearl Harbor tour on the same day that you board your NCL cruise ship. 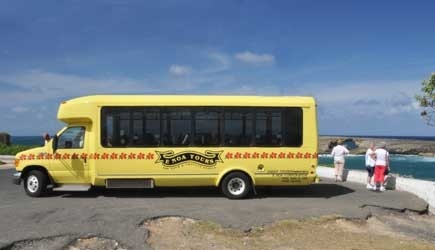 If you are on a cruise that visits Honolulu just for the day, the pickup time for this tour is usually too early for you to make it in time. One tip for photographing the memorial … when you are re-boarding the boat for the return to the vistor’s center, try to get in the last row. As the boat pulls away from the Arizona, you will get a very dramatic photo. 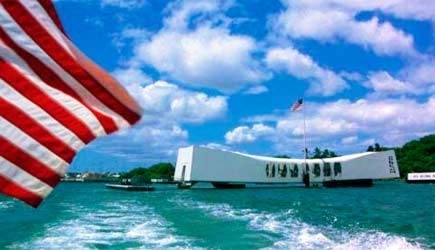 If you’re interested in other tours that include Pearl Harbor, check out Pearl Harbor & Punchbowl Tour!